A heartbreaking photo has surfaced of a park ranger comforting a gorilla that had just lost its mother to poachers. 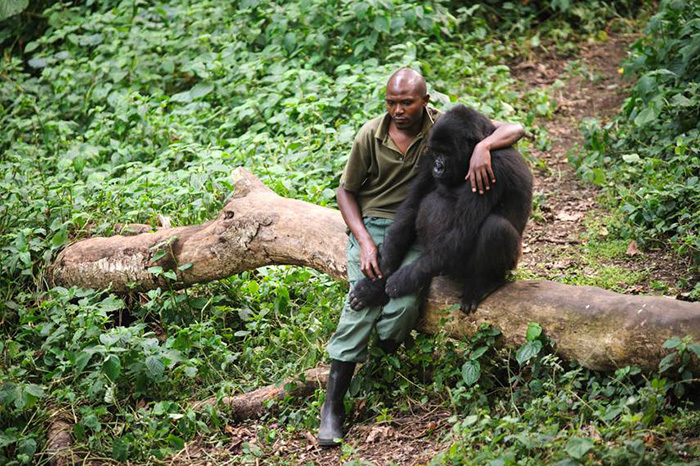 In this photo, Patrick Karabaranga, a ranger at the Virunga National Park in eastern Democratic Republic of the Congo, sits with an orphaned mountain gorilla in the park’s gorilla sanctuary. The gorilla appears to be showing his appreciation for the sympathy by placing his hand on the ranger’s leg. This gorilla, like the other three orphans currently living in the sanctuary, were brought there after their parents were killed by poachers or as a result of illegal attempts by traffickers to smuggle them out of the park.